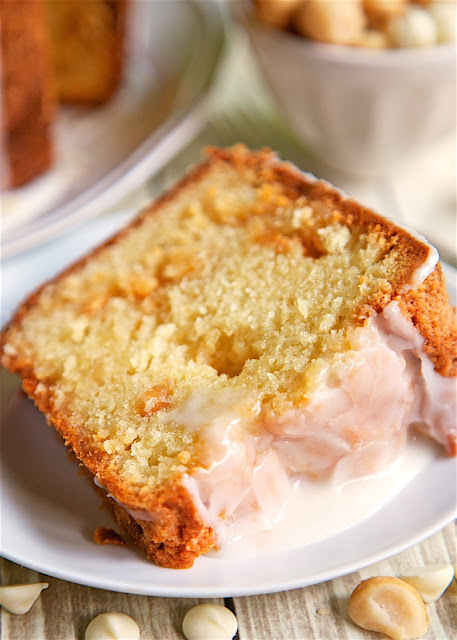 White Chocolate Macadamia Nut Pound Cake - DELICIOUS! An easy from scratch pound cake. Flour, sugar, butter, eggs, vanilla, white chocolate pudding, macadamia nuts, pineapple juice. Cake is drizzled with a quick pineapple glaze. This is CRAZY good!!! This didn't last long in our house! Great for a potluck or homemade gift. Next week is Hawaiian Foods Week. 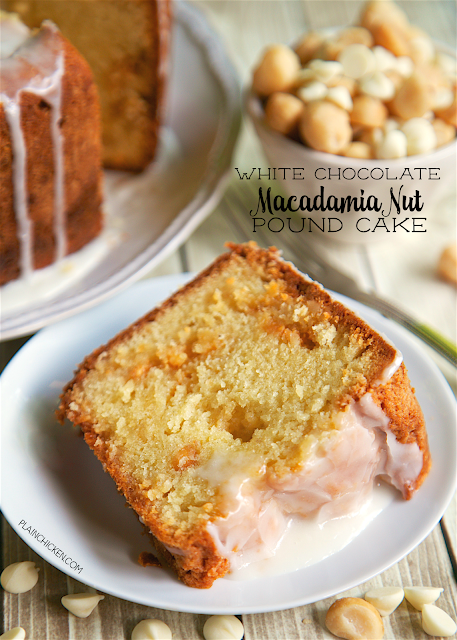 We are getting ready to celebrate with this delicious White Chocolate Macadamia Nut Pound Cake. The cake uses Mauna Loa Dry Roasted Macadamia Nuts and some Dole Pineapple juice in the cake and the glaze. O-M-G! SO good. Even though this cake is made from scratch, it is super easy to make. It only takes a few minutes to whip together. I covered the cake with foil about halfway through the baking time so the top didn't get overly browned. The key to making this cake super moist and delicious is a box of white chocolate instant pudding. If you can't find white chocolate pudding, you can substitute a box of vanilla instant pudding. Either way, the cake will be one of the best you've ever eaten! We served this White Chocolate Macadamia Nut Pound Cake slightly warm with a big scoop of vanilla ice cream! YUM! We ate way too much of this! It is dangerously delicious. I think it is the perfect treat for Hawaiian Foods Week next week!! Preheat oven to 325ºF. Butter and flour a 10-inch tube pan. Set aside. Sift together the flour, white chocolate pudding mix, salt and baking soda. Set aside. Cream together butter, sugar and vanilla. Beat for 2 to 3 minutes, or until light and pale yellow in color. Add the eggs, one at a time, beating well after each addition, stopping and scraping the sides of the bowl as needed. Mix in 3Tbsp pineapple juice. Reduce the speed of the mixer and add the sifted dry ingredients alternately with the sour cream. Mix until fully combined. Stir in white chocolate chips and macadamia nuts. To make the glaze: In a medium-size mixing bowl, mix together the powdered sugar and 2 Tbsp of pineapple juice. Drizzle over cooled cake. This is a sponsored conversation written by me on behalf of King's Hawaiian. The opinions and text are all mine.